Are high-profit real estate deals only for the wealthy? Is it possible to buy with no money down? Do you really have to know the "right" people? Let's answer by looking at some of the myths of real estate. 1. The good real estate deals are reserved for the wealthy. Of course money helps, but my first deal was a $3,500 lot - which I sold for a profit two weeks after I bought it. Smaller deals, using partners, low-down deals, or just putting aside $7 per day for a couple years until you have enough money for a downpayment - these are some of the ways to start with a little and invest in real estate. 2. "Zero down" isn't possible. 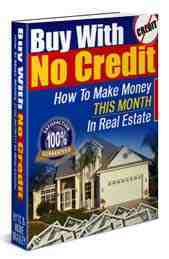 I sold a rental property for $1,000 down because I trusted the buyer, and I wanted the 9% interest and higher price. A cash-advance on a credit card for the $1,000 ($30 per month payments) would have made it a "zero down" deal. "Zero down" means none of YOUR money down, and yes, it happens. you have higher payments. You also spend more time finding suitable properties, and pay more for them (cooperative sellers naturally want more profit for their cooperation). There are zero-down deals out there - they just aren't always worth doing. 4. You need a lot of experience. It helps, but you get it by investing. Start with common sense, be willing to learn the numbers, and you can start where you are. 5. Good investors have a "knack" for making money. Well, sort of. But more accurately, they just took the time and risk to learn the market and to continue their education. 6. You have to know the "right" people. This is another partly true myth. It does help, so why not start the process? Talk to other investors, real estate agents, landlords, etc. 7. Great negotiating skills are necessary. Negotiating skills help with real estate deals? Of course, but learn to run the numbers and make offers based on them, and you can be the worst negotiator and still do okay. insider knowledge. Insider, outsider, whatever. You do need knowledge, but understand one deal, and you are on your way. Study, and study more, but the best "insider" knowledge comes from experience. 9. Fixer-uppers are the safest way to go. Poorly planned "fix and flips" have bankrupted even experienced investors. Most poorly purchased rental properties will only eat a little money every month, and grow in value over time. Fixer uppers are for making money faster, not more safely. 10. You need to make lowball offers. Low offers may help, but the numbers have to work, and you need a plan. You can offer MORE than the market price and make money investing in real estate. Just learn how to run the numbers before you do any real estate deals.